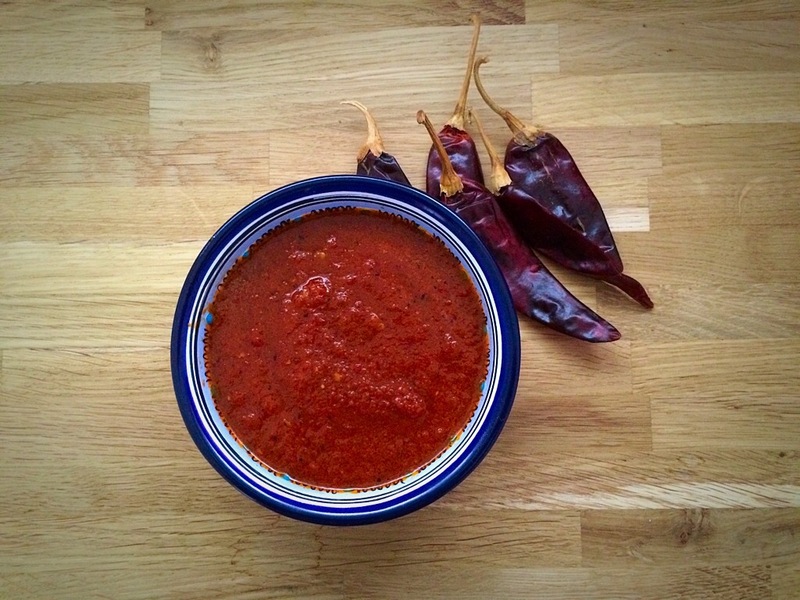 Puya is a chilli similar to guajillo, but a bit more spicy. I would say that is a combination of guajillo and arbol chilli, in fact, a lot people get confused between these two, as Puya looks very similar to arbol chilli, but Puya is a bit thicker than arbol. Puya or Pulla, as some people call it, has more fruity and intense flavour than guajillo. It goes very well with chicken, pork or beef. It is a good chilli to make salsas. This recipe was given to me by my sister Sonia, who kindly share it with me, she told me that is a salsa from Acapulco, Guerrero, it was given to her by her sister-in-law. My sister Sonia is an excellent cook just like my other siblings. The ingredients are very simple and similar to other salsas, but you use oil to fry it. The combination of the ingredients with the oil make a more silky salsa. 5 dried, clean and deseeded Puya chillis. Put the chillies on a hot frying pan to toast for 3 min making sure to turn them around to avoid burning them. Then put the chillies, onion, tomatoes and garlic in a blender and blend very well, in the meantime, heat the oil, with low heat, in the same frying pan where you toasted the chillies and add the salsa you just blended. Add salt to taste and cook for 15 min. Have it with your breakfast, tacos or any other Mexican dish! If you can’t find Puya chillies in the UK, you can use arbol chillies, which are widely available in the Mexican online shops.